Save an EXTRA 20% Off Our Sale Prices Plus FREE SHIPPING On Orders Over $99 (U.S. 48) If You Order On-line In The Next: Simply Enter Coupon Code "easter20" At Check-out! When you like your double breasted suits with an Italian cut and need them in big and tall sizes, this classy looking Double Breasted Suit by Vinci should more than do the trick. 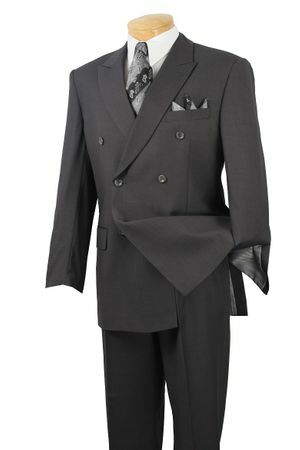 Featuring that classy style in big and tall sizes with side vents in the back and double pleat pants made of a very nice wool touch poly/rayon.